The VM2800 and VM3800 Vibra Check Vibration Meters are economical and compact and are ideal for obtaining spot meaurements of machine vibration. The VM2800 and VM3800 Vibra Check Vibration Meters are internally protected against electric noice, thermal shock and amplitude over load. 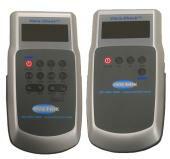 For full details on the VM2800 and VM3800 Vibra Check Vibration Meters see the data sheet below.